I heard that today too. After that I heard a request where a guy mentioned that he saw the band twice: "1988 and in 1997, on Brian's last summer tour." The request was for "Darlin.'" always like the version of surfer girl from 1971 Syracuse live boot. Particularly the drum solo by Dennis dragon as Dennis had just hurt his hand was out of the band. Earlier this evening (7-ish CDT), I heard “Psychodelic Sounds: Brian Fell Into a Piano”. He's a Doll and The One You Can't Have are fantastic Spector-type records. And Sharon Marie's "Thinkin' 'Bout You Baby" might be one of my favorite records in the whole wide world. It's exquisitely produced, tremendously emotional, thematically it's almost a follow-up to "In My Room". But that's just my opinion, and your mileage may vary. I don't think the tracks you've named are among the most problematic, that's for sure. I don't think the Honeys sounded very good vocally on their stuff (Diane and Marilyn sounded kind of shaky even on the "Spring" stuff in the 70s, but they did away with the shrill, "girl group" sort of sound and even if slightly flat-sounding on occasion, the "Carpenters-ish" vibe on the Spring material was much more palatable), and I don't think even "He's a Doll" *sounds* very good. It's a nice enough early-era Spector-ish Brian production, but sonically it's kind of sludge as a lot of that stuff is, and I've always thought the drum breaks on "He's a Doll" sounded kind of off/clumsy/sloppy. I think the more problematic stuff both in terms of composition but especially vocal performance and sonic quality would be the other stuff we've mentioned in previous posts like "The Revo-lution", "Humpty Dumpty", the Basil Swift track, etc. I suppose there's something kind of charming in a way about the Honeys stuff knowing Brian's closer association with them. But objectively, it was mostly b-list material Brian was servicing to these outside artists with a few key exceptions (and that would mainly be "Guess I'm Dumb" and a few others), and whether by random chance or for whatever reason, the actual "productions" themselves sounded inferior to what he was cutting with the Beach Boys. One of the best Brian "give-aways" of the era? "I Do", which conveniently has a true "Beach Boys" version that's superior in every way. Both Brian and the group's vocals definitely were a big part of why their stuff sounded better, even in the earliest days. 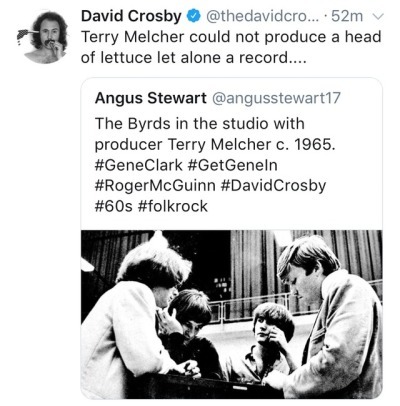 Murry was supposedly/allegedly pissed about Brian "giving away" "Surf City" to J&D, so I'm curious if some of his contemporary (and in the following couple of years) "give-aways" and outside production work was crafted in such a way to clearly *not* ever outshine the Beach Boys. It makes me think of the "give-aways" Lennon/McCartney doled out in the 60s. Those have rightly been framed as mostly inferior to their output, certainly their best output, again with a few standout relatively exceptions like some of the Peter & Gordon tracks. But even Billy J. Kramer doing "Bad to Me" sounds more substantive than most of the stuff on that "Still I Dream of You" Brian CD. Sharon Marie's "Thinkin' Bout You Baby" is interesting, but I'll take both the BBs "Darlin'" and even the American Spring version of "Thinkin' Bout You Baby" over the earlier version. You guys make some good points. No doubt there are some bombs in the BW productions/involvements category- I'd add the Hale & The Hushabyes and the Bob and Bobby tracks to that list. I paid big bucks for the Hale/Hushabyes single years ago on ebay, and I think I've played it all of twice. Yes, the drum fills in "He's A Doll" drive me a little nuts, especially after hearing the session tapes... Hal Blaine *nails* the drum fills on some of the earlier takes, but by take 8 I think he was getting a bit tired. To me, it sounds like BW was using the outside productions to experiment in the studio. He began using larger arrangements and making full use of the wrecking crew, and then once he was comfortable he brought that sound to the Beach Boys' music. He also pays bigger tribute to Phil Spector on these outside records than on anything the Beach Boys did, "Why Do Fools Fall In Love" excepted. Finally heard yesterday "Where I Belong" from "85"...a song I consider one of their better efforts form the 80's. While I enjoy the Beach Boys version (I used it in my wedding right after we were pronounced), I actually prefer the Castell's single. Great production on that. Made my day to hear ‘til I died today, then the following song ruined it. They played summer of love. I actually got angry about it and had to calm down. Summer of Love, disgraceful, likely the worst song they've ever recorded, and they've recorded a lot of songs. “Here We Go”. Not a bad song. Had some good harmonies. And while trying not to melt in my hot car it was nice to hear Frosty the Snowman! Am I the only person that finds this hilarious! They actually played that piece of sh*t! By the way, Bruce's Bob Sled group released their only single the same month that "Caroline No" and "Sloop John B" were released. It is amazing that Brian was in a group at the time with a guy who thought in that point in time (post-Rubber Soul, post-British Invasion) that it was a good idea to make a "surfer's going skiing" record to apparently "cash in" on that "trend." And no, I'm not doing a filledeplage homage there, I just don't know what would possess anyone to make such a blatant attempt to cash-in on something that at the same time was so out of style musically by that point. That'd be like me making a new version of "Who Let the Dogs Out" in 2003 and expecting that it was the perfect time for that to hit. I really do wish somebody could do a really nice, long-form interview with Bruce where he could discuss all these freaking insane projects he's done over the years. Of the all the Beach Boys and their sweet insanity, he seriously holds his own. Ha! Didn't think it was THAT bad. But that's in comparison with the other Bruce-related songs I've heard. I do find it funny that the only mention of the word "toboggan" I've seen in rock/pop has been in 2 Beach Boys songs and in the name of this group. Oh well, I will listen again on YT to experience the total ickiness of it. I had never heard that song before, heard it in the car, with lots of traffic noise, etc and in that context it didn't sound that terrible. I was told by more than one member that apart from being a friend, the main allure of Terry Melcher at that time was being able to place the band in very lucrative movie projects. The BB's got exposure and a nice payday. Saw this on Twitter today and thought it was funny. Powered by SMF 1.1.21 | SMF © 2015, Simple Machines Page created in 0.322 seconds with 22 queries.